Drag: When I cut in the ceiling and trim the paint dragged. The average person might not f drag. But, if you paint for a living you will feel it. The best way to describe it is that you have to work much harder to get a nice straight line in the cut. The paint is essentially working against you. Drips: When I moved the paint from the cut can to the wall drips would go all over the place. This does not happen with higher quality paints. Why does this matter to a painter. When you step off the ladder and step on the drop cloth there is a good chance your foot is going to step in wet paint, which can then be tracked all over the house. Drips and Sags on the Wall:. A drip is pretty self explanatory to most. A sag is like a really wide drip. I rolled out the wall and go back latter on to find drips and sags all over the place. This happens every time that I use Behr, and it is a pain to go back to fix, and I am always concerned that I am missing some. 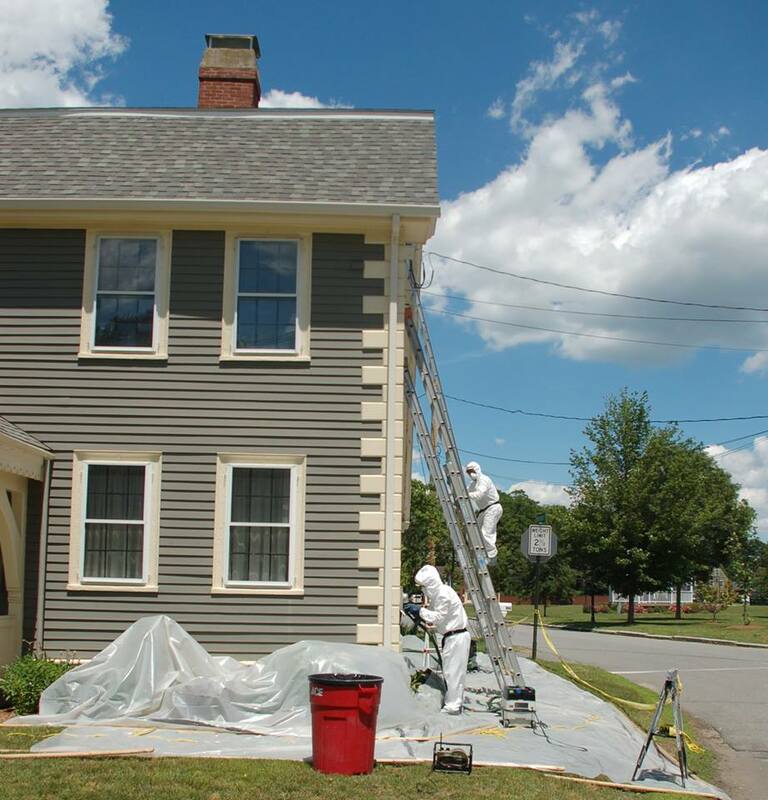 If you are a professional painter, you do not want to have to constantly going back to look for sags and drips. HIde: This is the ability of a paint to hide the color underneath it. Some colors have a really hard time doing this, such as reds and some yellows and oranges. I was covering a blue with a peach. This should have not be a problem, but I had to roll a third coat of the peach. Backrolling: This was only a problem with the ceiling paint, which I believe was Behr’s lowest quality ceiling paint. When you roll a wall or ceiling, the roller is often moved all over the place to make sure that everything is covered. Periodically a back roll is done. This is done with a dry (not a lot of paint on it) roller. The roller is very lightly rolled over the paint in a straight line. This is to get a smooth and even appearance. The Behr ceiling paint set up so fast that it was almost impossible to back roll. And, in general just rolling with it was like working with paste. It did not want to roll. There are also some things that home owners should really think about when purchasing Behr. .Touch Ups: Behr paint does not retain its color very well. The few times that I have attempted to touch up with Behr it has not gone well. One time I had to repaint an entire great room because a few small touch ups stuck out like a sore thumb. Knowledge: The people working at Home Depot behind the paint counter know nothing about paint. They are not the people to ask about advice. Over the summer I painted an exterior with Behr. After I had gotten a big chuck of the first coat on, I took a close look at the paint I was using. The Home Depot store had given the home owner interior paint. 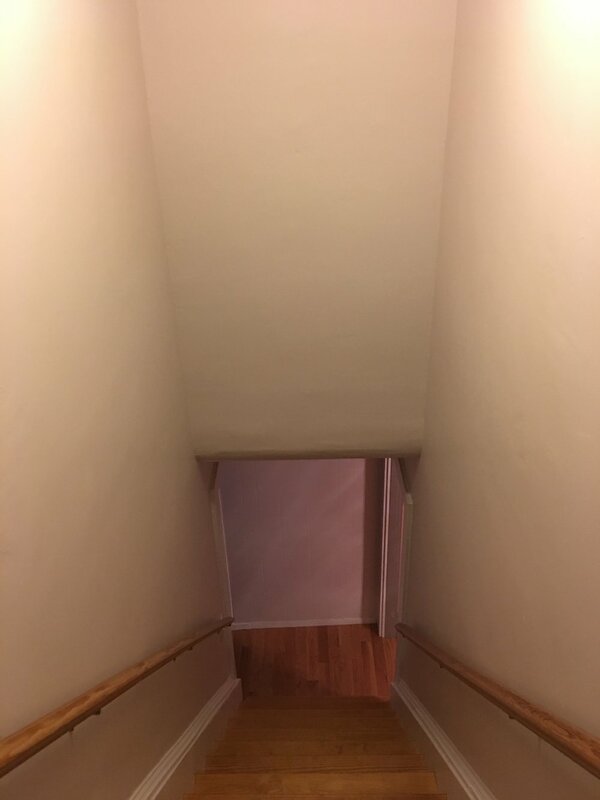 Trust Your Painter: I did a big repaint of an entire house. Customer bought the Behr paint. He bought way too much. 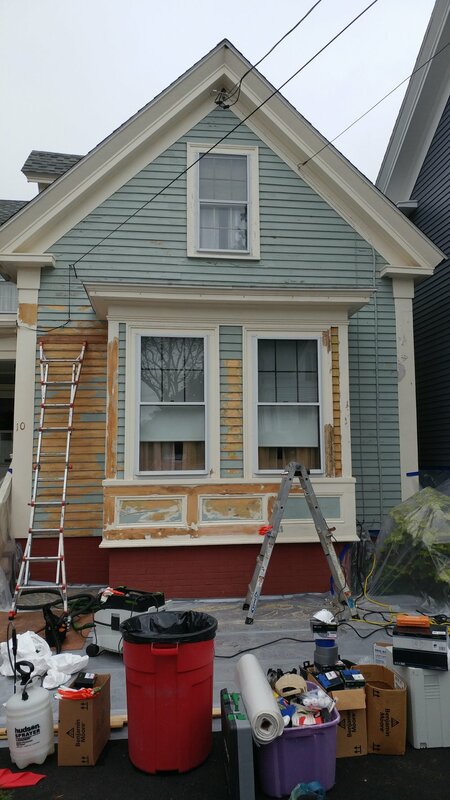 I could have purchased a much better paint and a more appropriate paint (they bought paint for the trim that really was not well suited for trim) for less money than what they spent on the Behr paint. I recently painted a two car garage ceiling (pictures are below). It had a lot of stains on it. When home owners want me to fix stains, they almost always assume that I am going to use Kilz. This product has be marketed as a great stain blocker. It might block some stains, but not all. In the past it has failed to work for me. Therefore, if I am dealing with stains, I use Zinsser’s Bin. It has never failed. Bin is a nasty product to work with. I always use a throw away brush, or assume that the brush that I am using will be trashed after I am done. Bin is a shellac based product, and has a very watery consistency. If you are doing a big job (like an entire ceiling) you will need to vent, or if it is too cold out to vent, wear a mask. I suggest using a mask for any big job with Bin. For job that is in the pictures below, I used a mask, wore long sleeves, a hat, rubber gloves, and work glasses that covered the side of my eyes. the glasses and my my gloves were covered with paint specks. Luckily I was able to clean off the glasses with denatured alcohol. Unfortunately, I forgot to take a picture after using the Bin. One coat did a great job at covering the stains. Sometimes, two coats are needed. But, it is important to ethat even if the stains can still be seen, the shellac keeps the stain from coming through to the latex finish coat. Only when the stain is still really noticable after a first coat of Bin, will I use a second. On this job, the Bin did such a great job with one coat, that I was able to finish the job with only one coat of flat white paint. 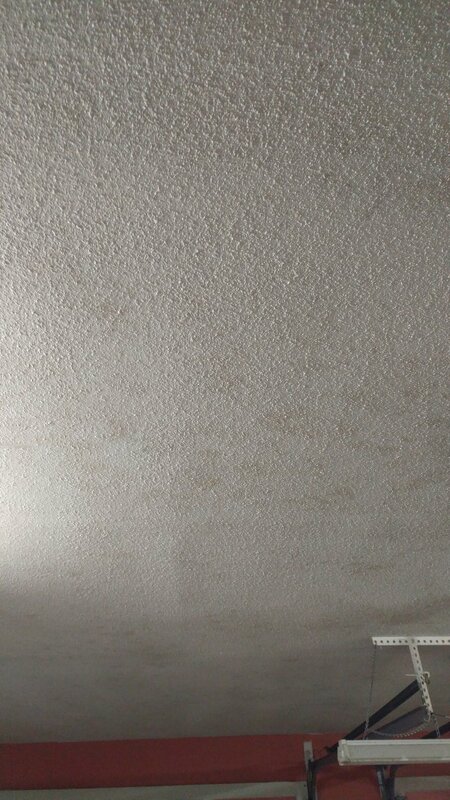 This was a garage ceiling, so the home owner was not overly concerned with the ceiling looking perfect. If I was painting a bedroom or living room, it is most likely that I would have applied a second coat of ceiling paint. Just finished these up last week. They were cleaned with TSP, sanded, primed with Zinnser Cover Stain, sanded, and then two coats of California Ultraplate. I brushed them, as opposed to spraying. It is that time of year...early Spring with thoughts of enjoying long warm days outside, and ending your day with a grilled steak and cold beer on your beautiful deck. The problem is that when you look outside your back window that deck is far from beautiful. Although structural sound, the last time it was cleaned or stained was well over a decade ago. Before you decide to do anything to the deck, take a quick glance at this blog which will hopefully help you moving forward. It is important to realize that decks take a pounding. In the Winter they are bombarded with snow, ice and sleet. It the Summer they are in constant sun, or shade which can encourage mold and mildew. And, they are constantly walked on, and have furniture dragged across them in the warmer months. 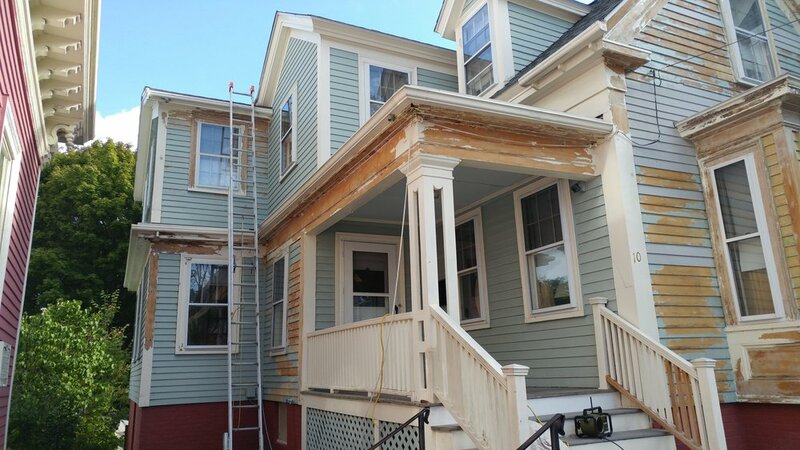 The reason for pointing this all out is that unlike the rest of the exterior of your home, whatever you put on a deck it will not last as long as the paint or stain on the rest or your home. For the horizontals (the stuff you walk on), you can expect to have to stain every couple of years, if you want to protect the wood and keep it looking good. A lot of companies such as Behr and Rustoleum are selling products that you just roll or brush on your deck without and prep and it will restore the beauty to you once ugly deck. These products are nothing more than thick paint and they do not work. Go online, not to the website of the company that sells the product, and read the results. I am often find online reviews very dubious, but in this case they are right on. I have seen failures of this stuff many times. And, once they fail you have not only wasted your time money, it is now going to be more difficult to do the job correctly due to the need to remove the "quick fix" before a real stain is applied. If the deck has grey wood it needs to be removed. This can be done with sanding or with chemicals. If it is big deck I recommend chemicals. It will also need to be cleaned. Some products will remove grey wood and clean. You will also need to neutralize the chemicals that remove the grey wood. No matter what stain company you decide to go with there a few things you should consider. Solid stains should not be used on the deck (the part that you will walk on and drag furniture across). Solid stains are only made in acrylic and they do not penetrate into the wood as non-solid stains do. Therefore they will begin to wear soon after they are applied. Go with a semi-solid, semi-transparent or transparent stain on the deck. If you really do want the solid stain look on the deck, you can do something called a wet coat with the a semi-solid. This requires the second coat to be applied before the first coat is dry. Therefore you have a coat of stain that has penetrated the wood, but looks like a solid. Although there are many good acrylic stains, I still prefer oil over acrylic. I think that they just last longer. 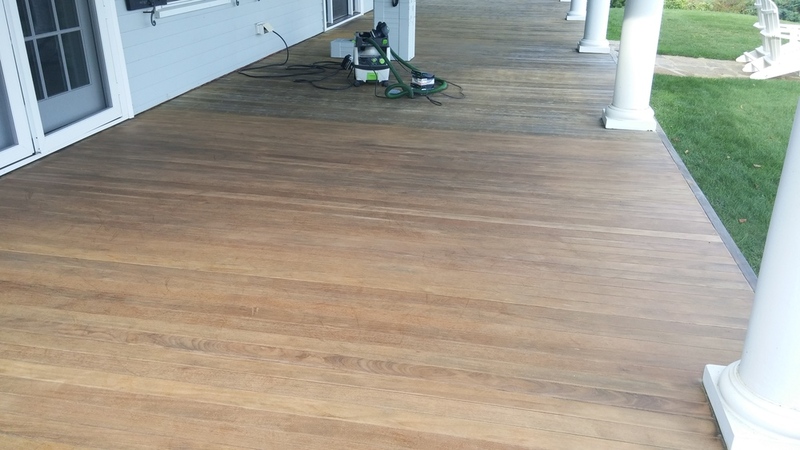 Once you spend the time or money (or both) getting your deck to look nice, the key is to not let it deteriorate to a level that it will once again need grey wood removed. Cleaning and applying a fresh coat is much easier and cheaper than a total redo. I recently refinished an Ipe porch (pictures are below) And, it was quite a learning experience. For those that are new to Ipe wood, Here is a bit of information that I learned before and during the process of restoring this deck. And, by restore I mean that the deck had not been treated for several years the wood had greyed. Ipe wood is native of Central and South America. Ipe wood is extremely hard. It sinks in water. Ipe, I was told, is very hard to burn. Ipe is beautiful, but it also require a lot of upkeep. When I say hard, I mean hard. It is often referred to an "iron wood." Let me relate my experience with the wood so that you can get an idea of what this means. I had hoped to use a deck sander to sand this porch which was just under 750 square feet. However, almost every piece of wood was concave, and thus the deck sander would only sand the edge of the wood. I needed to get a sander that I could use to sand the entire piece of wood. It took me a little over two days with a power Festool sander to complete this deck. I used 60 grit paper and I had to replace the sandpaper every 24 square feet. Festool sandpaper is the most durable sandpaper that I have ever used...it last much longer than most of the paper you will get in a hardware store. The Ipe wore the paper out. When sanding, I was told by more than one individual that 80 grit is the highest grit that should be used on Ipe. Anything higher will polish the wood...close the grain so that it will not accept an oil. First the porch, and this is true for any porch or deck, had to be cleaned. It is not necessary to own a power washer to clean a deck. In fact, if you do not have a lot of skill with a power washer then you should not use one with Ipe wood, damage done by the washer will stick out like a sore thumb. I treated this deck three times and never used a power washer...just a stiff brush, elbow grease, and a hose. If you have an Ipe deck or porch and you do not know what it was treated with the last time it was finished, then it has to be removed. I used Benjamin Moore remove to take off any remaining oil that had been previously used. Finally, I used a brightener to bring the wood back to its original color...before the elements had gotten to it. Then, one coat of Penofin Hardwood oil. This is the fist time that I used this product. Pretty simple to apply. Temperature of the wood must be above 45 degrees. I applied with a brush, let is sit between 20-30 minutes and then wiped of the excess. I started in the middle of the deck and moved towards the sides. I started out doing two feet of at a time. I did one side, let it sit, while I did the other side. I wrote down the time that I finished applying the oil so that I would not wipe it off too early. By the time I was done, I had work it out that the optimal area to do was 4 feet of wood at a time (the porch was 12 feet wide). By the time I applied the oil to 4 feet, it was time to wipe the last four feet that I had oiled.